This package includes two primary components: a web broswer user interface and command-line shell scripts. Both components can be installed and run on most Linux/UNIX/FreeBSD web servers with PHP 4.3 or greater. For documentation about installed components, see the documentation page. (1) Download and extract the scripts to your web server. (2) Edit the environment variables. (3) Create and edit the sitemap configuration. (5) Generate the data files. The user ID that runs the command line scripts requires write access to the data directories. This can usually be accomplished by changing ownership of the directories to the httpd server user name, like "apache"
File permissions for all files and directories can be set to 755. (7) Select the sitemap URL pages. In the File Tree View, use the green and red buttons to select the files to include or exclude from the sitemap. Entire directories can also be selected or excluded. Save the File List View. 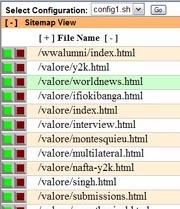 Open the Sitemap View and assign priority and change frequency attirbutes for the URLs that have been seleceted. Save the Sitemap. sitemap.xml can now be copied to your document root directory, or any location that is accessible to search engines. See sitemap.org for more details.